Some parents believe their child’s baby teeth are less important than their secondary teeth. Take it from the team at the Pediatric Dental Center in Burlington: these parents could not be more wrong. Your child’s baby teeth, or primary teeth, are just as important to their health, speech development, and confidence as their permanent teeth. The twenty primary teeth set the stage for a beautiful smile. Taking care of them is crucial! Some kids put up a real battle when it’s time to brush their teeth. This is understandable. A parent takes a pokey bristly thing, smears some minty paste on it, puts it in their mouth and scrubs their teeth. Of course it doesn’t appeal to some young children. Sometimes parents want to give up the struggle until their child is older. We urge you to keep trying. 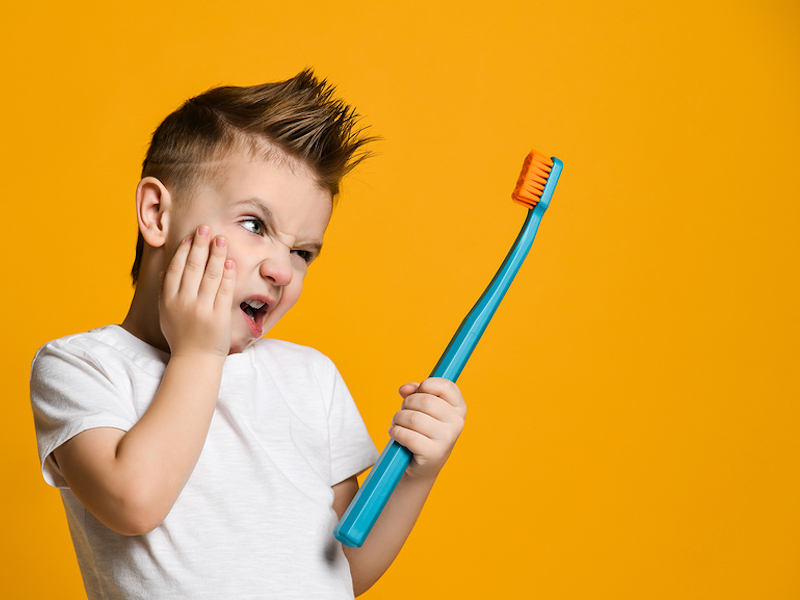 Here are a few suggestions for toothbrushing tantrums. If the toothpaste is the trouble, brush with a smaller amount or even without it at first. The goal is to remove food particles that will lead to plaque and bacteria, eventually causing cavities. Toothpaste is not needed for removing food particles. Fluoride is important, however. If you are concerned that your child isn’t getting enough, talk to Eric Soper about fluoride supplements. Take your youngster to the store and have him or her choose a new, soft-bristled toothbrush. Maybe buy two, so he or she has some control in picking which one to use each time Let your child do the brushing first, then survey and brush the areas that might have been bypassed. Teaching your child that brushing is non-negotiable is an essential first step. To develop the habit, keep the time short and slowly increase the sessions. After it has become part of the routine, add time by singing songs or brushing your teeth at the same time. Some Kentucky parents have had success with setting a timer. Compliment your child on their remarkable effort in taking care of themselves. Be sure to preserve a positive attitude. Let your child know that you love their beautiful smile and want it to always be shiny white. Positive reinforcement and establishing a routine are critical parts of childhood dental brushing. We want children to be passionate about a habit that will affect their health throughout their life. At the Pediatric Dental Center in Burlington KY, we care about the dental health of all our young patients. Schedule an appointment with us today.